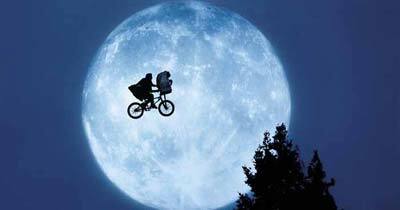 The video above features the theme tune to the E.T. film which was written by John Williams. Released in 1982, E.T. 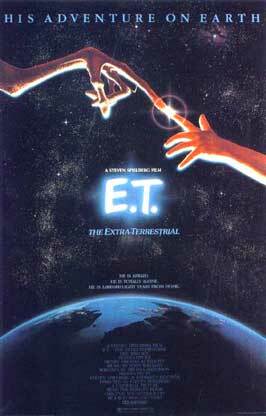 The Extra Terrestrial is a classic American sci-fi movie co-produced and directed by Steven Spielberg. Of course, if you were a child of the 80s then you would have known that already, unless you were living on another planet, of course! This heart-warming story revolves around a lonely ten year old boy named Elliot (played by Henry Thomas) who becomes friends with an alien (E.T.) who has become stranded on Earth. Whilst trying to keep E.T. hidden from his Mother and the Government, Elliot and his siblings try to help the confused, but friendly alien to return home. E.T. became even more of a success than Star Wars, and soon became the highest-grossing movie ever. This was surpassed in 1993 by Jurassic Park which just happens to be another Spielberg classic. However, E.T. holds the record for the highest grossing film of the 1980s. 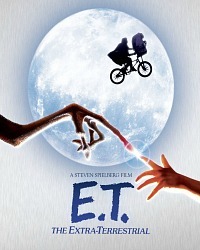 I was 14 when this film was in the cinemas, and the mention of E.T. always triggers a memory of some moron stealing my seat while I was getting some popcorn. Luckily, he was about half my age and so there was no problem getting my seat back! Actually, come to think of it, most of the audience was younger than both me and my friend from school! We still enjoyed the movie, nonetheless. You may remember that E.T. used this concoction to phone home. It included a Speak & Spell by Texas Instruments, a coffee can filled with electrics and an umbrella with a tin foil lining. E.T. starred Dee Wallace, Henry Thomas, Robert MacNaughton, Peter Coyote and, of course, Drew Barrymore.